2018 was a bit of a rollercoaster for the precious metals — here we’ve rounded up the price highs and lows. Gold had a tumultuous year, with the metal finding its highest level in January, when it hit US$1,357.70 per ounce, but slipping to lows of US$1,182.40 in September. Most of the yellow metal’s fate was made on the back of geopolitical issues and the movements of the US dollar. In addition, four Fed interest rate hikes throughout the year caused instability for the precious metal’s price. Despite all of this, many analysts believed that gold could have done much worse for the year. 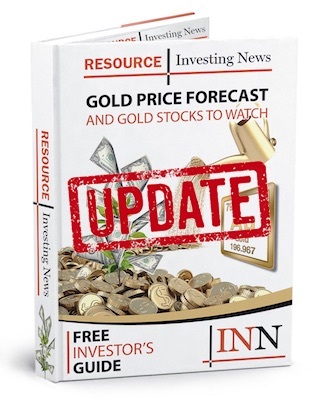 “I think that the gold price, in US dollar terms, has held up remarkably well in the face of a very strong US dollar and the rapid pace with which the Fed has raised interest rates,” Brian Leni, founder of Junior Stock Review, told the Investing News Network. As of 9:35 a.m. EST on Friday (December 28), the yellow metal was up 0.26 percent and was trading at US$1,277.20 per ounce. Meanwhile, silver also suffered from a lackluster 2018. The white metal reached its yearly peak in late January, when it hit US$17.54 per ounce, but found itself setting records when it crashed to lows not seen in two and a half years when it fell under US$14 on September 11. As with the yellow metal, geopolitical concerns, consistent interest rate hikes and a rallying US dollar kept silver prices down throughout the year. Additionally, investors lost interest in the white metal during the year. “There’s been a lot of people that have given up on the silver market, and that is verified by the amount of retail sales in silver,” stated David Morgan of the Morgan Report. As of 9:52 a.m. EST, the white metal was up 0.63 percent and was trading at US$15.34 per ounce. As for the other precious metals, both platinum and palladium were hit negatively by the rallying greenback and the increase of waning interest from investors. However, palladium managed to have a banner year thanks to a boost in demand from environmental concerns causing a global shift from diesel to gasoline and hybrid vehicles, which use more platinum in catalytic converters. Palladium climbed almost 18 percent in 2018 and was able to surpass platinum and rival gold. The palladium price reached its yearly peak on December 5, when it traded at US$1,252.68 and finally surpassed gold as the highest-trading precious metal. In contrast, the metal’s lowest point of the year came in mid-July, when it was around US$886 per ounce. As of 10:48 a.m. EST, the palladium was trading at US$1,258.00 per ounce. Unfortunately, platinum did not fare as well as its sister metal palladium and dipped almost 16 percent in 2018. Aside from a rising US dollar aside, platinum took hits throughout the year thanks to a lack of demand for diesel-powered cars in Europe and China as the metal mainly used in catalytic converters for gasoline-powered cars. The platinum price reached its yearly peak on January 19, when it traded for US$1,010 per ounce. However, the metal’s lowest point of the year came in September, when it traded around US$776 per ounce. Our top precious metals of 2018 featured a report on the gold price rising on the back of US and China trade war tensions, an interview with an interview with Peter Megaw of MAG Silver (TSX:MAG,NYSEAMERICAN:MAG) on silver and a report on how the platinum market was expected to balance out in 2018. The gold price rose on Monday (April 9) as the US dollar fell due to caution over the prospect of an escalation in the China-US trade dispute. Spot gold gained 0.3 percent to reach US$1,336.80 per ounce, while US gold futures for June delivery climbed 0.3 percent to sit at US$1,340.10. On Friday (April 6), trade war concerns increased after US President Donald Trump asked the US Trade Representative to consider an additional tariff on US$100 billion worth of Chinese products. The silver price struggled in 2018, but like many market participants, Peter Megaw of MAG Silver saw improvement in the white metal’s future. Platinum production was on the rise in 2017, but the market is on track to be balanced this year, as supply declines and demand picks up pace, the World Platinum Investment Council (WPIC) said in a report. Last year, platinum production increased by 1 percent while global demand fell 7 percent year-on-year, leaving the market with a 250,000-ounce surplus. However, the market is expected to return to equilibrium this year, with an estimated small surplus of 25,000 ounces. Looking to the year ahead, INN published outlooks for each of the four precious metals covered. Gold experts stated that a slow-down in interest rate hikes next year will have a negative effect on the US dollar, which in turn will increase investor interest in the metal as a softer greenback makes bullion cheaper to hold and therefore more appealing. Silver experts believe that once gold begins to rise the white metal will follow suite. Some analysts also expect silver to rise as demand for the metal from the automotive industry inevitably increases next year. As for platinum, many experts are forecasting that while prices will increase in 2019, they will only do so marginally. Analysts believe that thanks to the ongoing decline in sales of diesel vehicles, most of the metal’s price increase will be dampened. Finally, market watchers believe that palladium will take its 2018 shine into the new year. Analysts have predicted that palladium will continue to rally in 2019 thanks to an ongoing increase in demand for the metal paired with insufficient supply.